This beach scene was painted for this months challenge on Wetcanvas, seemed a great way to get started on warmer subjects as right about now many are a little tired of freezing cold temperatures and winter white-outs. I have no earlier experience painting people or clothes, so I thought this scene would give me an opportunity to try my hand at both subjects and get a feel for painting surf again with oil pastels. Oh my it was interesting to say the least, after a few scrapes and re-starts here is my attempt . . . calling this oil pastel, Girls at Beach (8×10 – on a gesso prepared hardboard). 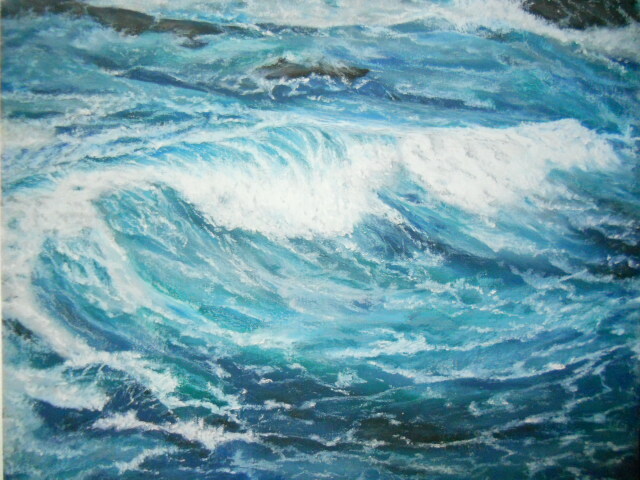 This entry was posted in About Oil Pastels, OPs New Paintings and tagged beach, ocean, oil pasels, sand, wave. Bookmark the permalink. Looking at this painting again, it just makes my heart smile. Thank you, your comment means a lot. Thank you for your kind comment and thoughts. Thanks Violet – one of those nice days for a stroll on the beach (we wish!). This is amazing as always. You’re gonna think I know only one word in English because I always tell you that your paintings are amazing. But they really are. You make me laugh Cha, thank you so much for your generous comments. Now if I could only paint portraits like you ~ likewise, they are fantastic!! Love your interpretation of summer and sea. I can feel the warmth and the salt of the sea breeze. Thank you very much Gallivanta for your nice comment – appreciate it very much! Hi Poppy – oh yeah, I’ll bet you can relate to the nice warm beach (is that Hawaii I hear calling your, lol)! Hey they are experiencing some 50′ surfer waves right now – the pictures are spectacular. Thanks for your nice feedback!! Thanks Patricia – I’m trying to get out of my box, but it’s so darn comfortable. Thank you so much Eunice for your nice comment! 🙂 Gorgeous work you do. Beautiful Mary, love the composition, the ease of the moment, lovely. Thank you Elena, the ease of the moment is what caught my attention – always enjoy reading what you have to say. Thanks! I think you did a great job! It’s lovely. Mary, you can do more figures and clothes! You did a great job. I also love you sea scene and the shadow of the girls. Thanks for your nice comment, appreciate hearing from you!! Excellent! 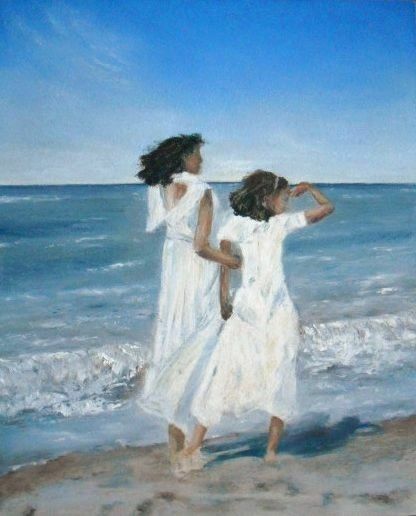 It reminds me of Sorolla, who painted lovely beach scenes. Thank you so much for such a beautiful compliment – really appreciate it! Uh Oh! I am beginning a collection of “favorites.” This one is very special and carefree. Thanks Dorann, so glad you enjoyed the painting! It was nice thinking about the sea and its warm breezes as I painted this scene. Mary we did not pass the winter yet… but at least we get a great feeling what to aim for. As usual joy to watch the skill train you are driving! Thanks Doron, just a little something to create a positive anticipation of what’s to come! Very beautiful, Mary! Light and the way you have painted their movements. This reminds me of Peder Kröyer – a Danish artist (Skagenmålare) who painted much like this. White clothes and sandy beaches. So wonderful Ann Christine, thank you – such a compliment. Really appreciate your thoughtful comment. Thanks very much Sharon!! We need a reminder of gentler temps are on the way. Seeing it on the post is photo-like, and still a pleasure when taking a closer look. Well done, Mary! Thank you very much – close shows all those blemishes, but then I guess that’s when you call it art. Right? I really appreciate it – thanks! LOL …. but the artist is probably the most critical. This is lovely! It feels so calming and refreshing. Hey Mamie, so neat to see you again – thank you for your lovely comments. I hope you are well and have been painting up a storm! gorgeous picture i love it! Thank you Kizzy – such a beautiful comment. I really appreciate it! Thanks very much – always appreciate it! Wow, that is just so lovely! Superb! For no prior experience you have done a fantastic job with the girls and the clothing! And the water! Yippee, Summer is coming! Thank Susan! Maybe one day I’ll devote some time to painting figures and clothing, it was fun to give it a try though! Oh yeah, summer is right around the corner – we have to just keep thinking warm temps! Beautiful, I can feel the sand and the water ;), very good! Hi Doris, love your comment – thank you! I hope you do check out Wetcanvas, what’s great is that they have challenges in the various forums based on mediums – it’s been very helpful for me in trying new subjects.